America has always been terrified of its children. Never more so than in the early decades of the 1800s, when packs of youths roamed the bursting new cities of the new united States. Small wonder, then, that a reformer who promised to round up these youths, to Americanize them, civilize them, and educate them, would be greeted with open arms. Keep those toes on the line! As have so many school reformers after him, Joseph Lancaster promised everything. His new schools would sweep city streets clean of lounging, threatening urchins. Lancaster’s system would teach them to be citizens, to read, write, and pray properly. It would turn feckless youth into proper Americans, and it would do it all without costing a single extra cent. Lancaster’s schools promised to turn New York, Boston, Philadelphia, and Baltimore into modern cities, not just collections of provincial villages. They promised more than just new schools; they’d create a whole new system, a new way of ordering urban chaos. The eager city boosters who pushed for Lancasterian schools learned their lessons the hard way. They were the first generation of school reformers to find out that school systems needed more than just schematics and instruction manuals. They needed more than flashy new technology and assurances that they were on the cutting edge of modern city planning. They needed more than earnest, energized, self-sacrificing teachers, parents, and students. As reformers in every century have discovered over and over again, there is no silver bullet. No matter how painstakingly modern, how alluringly metropolitan, how theoretically feasible, no school reform can solve all of society’s problems, especially if it promises to do so on the cheap. By the middle of the 1830s, city leaders in the United States found out what London’s elites had decided years earlier. Lancaster was no savior. His overinflated promises couldn’t match the difficulties of corralling and educating a modern city’s children. His relentless self-promotion couldn’t erase the complicated issues of finance and discipline that modern urban school systems needed. The promise of Lancasterian schools collapsed just as suddenly as it had taken over. In my new book, tentatively titled The System: Joseph Lancaster and the Roots of America’s Public Schools, 1810-1840, I’m exploring this first episode in America’s long struggle with systematic urban school reform. In the first decades of the 1800s, reformers and politicians learned the bitter lessons that new generations of reformers from John Dewey to Michelle Rhee have found themselves relearning in every century. Urchins check in…citizens check out. Why is school reform so difficult? As Joseph Lancaster’s dramatic story illustrates, reformers overpromise. They sell an impossibly simplistic bill of goods. Politicians latch on, desperate for votes, desperate to be seen taking decisive action. Parents and teachers allow themselves to hope. Every time—in every city, in every century—when the dust settles, ambitious reformers and politicians have moved on and schools stay the same. Who are America’s creationists? What do they want? Why do they think Jesus rode around on a dinosaur? 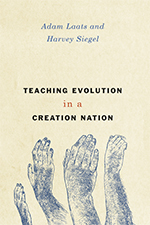 In my new book, I argue that common misconceptions about creationism have led us into a full century of hapless and unnecessary culture-war histrionics about evolution education and creationism. In fact, tough as it might be to notice, America does not now and never has had deep, fundamental disagreement about evolution. If we only read the headlines, that statement might seem obviously false. After all, as we’ve seen in Gallup polls since the 1980s, nearly half of Americans say they think our species was created pretty much as-is within the past 10,000 years. And of those creationists, about a quarter have been to college. For those of us who aren’t creationists, it is difficult to understand how so many people—apparently even educated people—can cling to such outlandish anti-scientific ideas. Yet it doesn’t take much time to find more evidence everywhere we look. In recent state school-board elections in Texas, for example, front-runner Mary Lou Bruner thought dinosaurs had survived Noah’s flood on the ark. For what it’s worth, Bruner was also convinced that President Obama had put himself through law school by working as a prostitute. It’s not only down in Texas. When President Trump picked his cabinet, he chose ardent young-earth creationist Ben Carson to head the Department of Housing and Urban Development. Education Department Secretary Betsy Devos has done more than just endorse creationism; she has funded creationist pundits and schools. Are they simply dummies? Wacky conspiracy-theorists like Mary Lou Bruner sure seem like it. But that label is hard to accept in the case of Dr. Carson, a leading pediatric neurosurgeon. Can someone be a dummy if he invents a new way to operate on baby’s brains? Explaining away creationism as mere stupidity doesn’t seem to fit. Yet it is easy enough to find people who will tell you that it does. Atheists such as Oxford’s Richard Dawkins famously dismissed creationism as merely an outbreak of ignorance, insanity, or sheer wickedness. For some people, Dawkins’ explanation might be enough. For the rest of us, however, Dawkins’ angry harangues don’t really help. We might not like creationism or understand creationists, but the answers don’t seem as stark and simple as Dawkins says they are. So where can we go next? If we hope to understand America’s culture wars over creationism, we tend to get caught in an unproductive loop. The most active pundits and writers about creationism tend to be the angriest on both sides. Radical creationists tell us that evolution equals atheism. Radical atheists agree, and insist that creationism is only for the radically ignorant. Not surprisingly, the truth is more complicated. Though it might not seem possible to the casual observer, the battle lines in American culture between creationism and evolution are not really between creationists and the rest of us. There is not a stark and simple divide between religious creationists who think the earth was made 6,000 years ago and atheist scientists who disagree. Americans do have significant disagreements about creationism, though, and once we press into the history of the creationism culture wars, those actual battle lines leap into high relief. Hard as it may be to believe, the real battle is not between creationists and evolution. Americans are not and never have been locked in a culture war between creationists and evolution. We could not possibly be, for two fundamental reasons. First, today as in the past, almost all Americans are creationists of one type or another. At the same time, almost all Americans, including creationist Americans, want their children to learn rigorous, mainstream evolutionary science. These facts aren’t hidden, yet they remain shocking to those who do not understand the real world of American creationism. We Don’t Disagree about Evolution explains the history and current state of America’s true battles over creationism. It offers a nuanced but simple prescription to solve them. The book’s recipe is straightforward. In order to understand the creationist culture wars—the real ones, not the phony headlines—we need to begin with a better understanding of creationism itself. Next, we need to clarify the areas on which we really do disagree about evolution. They are not insignificant, but they can be overcome. All of us—religious, secular, and not sure—need to recognize a few things: 1.) what creationism truly is in twenty-first century America and 2.) what we really want out of our public schools. In addition, all of us need to accept the fact that we can’t force other people to admit we’re right. In short, we might not agree about religion and science…but that’s okay. The division we’ve gotten used to fighting about isn’t really about those things at all. In this book, I’m arguing that our true division about creationism is not between creationists and evolution-lovers, but between two other types of believers. Once we recognize this fundamental truth about American creationism we can notice new ways to get over our century-old go-nowhere battles about textbooks and Darwin. Will everyone agree? Certainly not. But the fiercest opposition to this program will be from the very radicals who have warped and distorted our conversations about creationism for a full century. Once we understand real American creationism, we will be able to see how insignificant those radical voices really are. UPDATE: I’m happy to report that this work has been funded by a generous fellowship from the Humanities Institute at the University of Connecticut. Their program in Humility and Conviction in Public Life funded me for a semester of full-time work on this project. When will it hit the shelves? Hard to say, but not for a while yet. I have a draft of the manuscript in hand and I’m tinkering with it. At this point, I still need to find a publisher and all that will take some time. I’ll keep you posted. If you want to run for President as a Republican these days, there seems to be a new requirement. In addition to shaking hands, kissing babies, and eating barbecue, every GOP hopeful since Reagan has added a stop at a conservative evangelical college. Why? What do these schools mean in the fractious politics of culture-war America? In my new book, Fundamentalist U: Keeping the Faith in American Higher Education, I’m exploring the complex history of evangelical and fundamentalist higher education. In many ways, these schools have functioned as institutional hubs in the kaleidoscopic world of conservative evangelicalism. 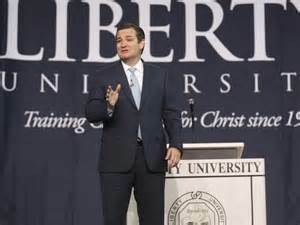 From Reagan to Romney, from Cruz to (Jeb) Bush, politicians hoping to woo the conservative religious vote have visited conservative schools such as Bob Jones and Liberty University. When the GOP contest kicked off for 2016, the tradition continued. Texas Senator Ted Cruz jump-started the race in March, 2015. Guess where he headed to make the announcement? And when it came time for Liberty’s 2015 commencement address, was it any surprise that Liberty welcomed Governor Jeb Bush as a speaker? And today, the connections between the Trump White House and the Falwell mega-campus are tighter than ever. When it came time for President Trump’s first commencement address, there was little doubt where he’d go. It makes sense. Schools such as Bob Jones and Liberty, as well as Wheaton College, Biola, The King’s College, and a host of other institutions, have educated generations of evangelicals in the distinctive intellectual and cultural traditions of their faith. Students at these schools agree to more rigid lifestyle rules than they would on secular campuses. And they agree to have their educations shepherded by faculties who have signed on to detailed statements of faith. Just as alumni of the Ivy League might brag about their alma maters, so alumni of these schools feel a distinct connection to their colleges. Politicians hoping to prove their conservative credentials want to jump on that bandwagon. But that does not mean that these colleges are somehow monolithic. The differences between these schools often loom larger than their similarities, at least in the world of evangelical Protestantism. What does it mean to be “creationist?” What changes are healthy, and what are dangerously heterodox? And what is the proper, Godly relationship between men and women? There is no single “evangelical” answer to these questions. Just as at pluralist campuses, evangelical campuses have been rocked by controversy on all these issues. But there is a palpable sense of connection. There is something that unites the fractious world of evangelical higher education. And in this book, I’m asking questions about it: What did such schools hope to teach each new generation of evangelical student? How did they hope to raise up new generations of faithful young people in a country that was slipping farther and farther into secularism? And, importantly, how did students respond to these efforts? If we hope to understand America’s continuing culture wars, we must make sense of the many meanings of these institutions. After all, our culture wars aren’t between one group of educated people and another group that has not been educated. Rather, the fight is usually between two groups who have been educated in very different ways. Why is it so difficult to lead an evangelical college? Read my interview with the Trollingers at Righting America. Why Fundamentalist U? Read an author interview at Inside Higher Ed. Read more at Chronicle of Higher Education. Listen to an author interview at Phoenix’s KJZZ. Keeping the faith–read an author interview at Religion & Politics. Race, confessional theology, and Marilynne Robinson: A talk about Fundamentalist U (and other things) with Adam Holland of The Daily Brew. Can we ever get beyond our culture-war prejudices? Can studying schools help us understand religion? A talk about Fundamentalist U with Professor Andrea Turpin at Religion in American History. What do evangelical colleges mean to those of us who aren’t (at all) evangelical? Listen to my interview with Friendly Atheist Hemant Mehta to find out. What are three reasons to read Fundamentalist U? Check out Justin Taylor’s recommendation at The Gospel Coalition. In History of Education Quarterly, historian Andrea Turpin of Baylor University, the author of a fantastic, award-winning recent history of American higher education, had this to say: “As a sympathetic outsider to the institutions he studies, Laats pairs depth of research and analysis with a commitment to rigorous fairness to his subjects. In Fundamentalist U, Laats does not merely explain the internal logic of an interesting, but isolated, group of colleges and universities; he also raises critical questions about the nature of broader American higher education and culture in the twentieth century. . . . Laats is an engaging writer, and the book’s chapters are filled with fascinating stories cleverly told. . . . Fundamentalist U reshapes our mental landscape of twentieth-century American higher educational institutions and is essential reading for understanding both their history and their present. What have conservatives wanted out of America’s schools? What has it meant to be “conservative” about American education? When I started asking those questions a few years back, I went at finding the answers the wrong way. At first, I visited the archives of prominent conservatives such as William Bennett and the Daughters of the American Revolution. In short, the tradition of educational conservatism has ranged beyond any single self-conscious movement or organization. From the 1920s through the 1970s—and, I think, well beyond—conservatives have agreed on a few basic principles. First, conservative activists have rarely questioned their shared assumption that schools matter, a lot. Among conservatives just as among twentieth-century progressives, activists have assumed that what goes on in schools will determine what goes on in society. As a result, conservatives have insisted that schools must push a steady diet of religion and patriotism on their students. The specific meanings of proper public religion and patriotism have changed significantly, but conservatives have always insisted that schools must never wobble in their firm adherence to the inculcation of traditional values, however those values are understood at the time. That’s my argument, anyway. Is it any good? To find out, you can listen to an interview at National Review with John Miller. Well researched, well written, and well argued, The Other School Reformers offers a clear, evenhanded account of conservative activism in public education. Laats’s analysis of the social and political contexts in which this [conservative] resistance [to educational reform] occurs makes this book a must-read for anyone interested in or hoping to effect educational reform—whether in the sciences or in other disciplines. The Other School Reformers: Conservative Activism in American Education is the first comprehensive historical study of conservative educational activism in the United States. . . . Laats makes a compelling argument that a powerful tradition of educational conservatism has played a decisive role in shaping American public schools and culture from the 1920s through the present. . . . 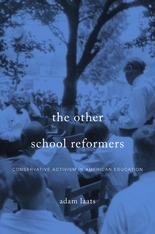 The Other School Reformers makes a vital contribution to the history of education by identifying a clearly discernable and politically powerful tradition of conservative educational reform in the United States since the 1920s. One of this book’s strengths is its ability to explain the connections between these four episodes separated by time and space, and also to account for such differences as the changing ways that conservative educational activists dealt with race and religion. The Other School Reformers directly engages several historiographical discussions and will be of interest to historians in a variety of fields beyond the history of education and the history of conservatism. By looking at conservatives’ fights around education, the book fills in the shadow figures against whom progressives—a group that historians have written much more about—fought. It also broadens our understanding of conservatism in the twentieth century by illuminating the centrality of education. Any scholar interested in how to tell a national story through a local lens will also benefit from reading Laats’s work. By excavating conservatives’ activism around public school education and by helping to reframe the discourse around education, Laats’s account will enrich both historical and contemporary debates on education and politics. The Other School Reformers is about big ideas and big questions. At bottom it is a valuable portrait of how Americans vie, in an ongoing way, to answer the questions that matter most: Why do we educate? What are schools for? And, in the context of crosscutting claims about the intrinsic relationship between ‘education’ and ‘democracy,’ what has, does, and should each of those terms mean? If we are wont to think that American conservatives mobilized in opposition to Communism or Socialism, secularism, or the political demands of women and minorities, both Kruse and Laats, but especially the latter, show us how much conservative opposition in America has been directed against a modernist philosophical tradition that is uniquely the country’s own. If American conservatives have long demonized unsavory ideas as foreign imports, they have also demonized the country’s own anti-foundational traditions. Among historians, the Scopes Trial of 1925 hogs all the attention. In my first book, I wondered what else conservative evangelical Protestants wanted out of American education. The answers I found surprised me. This book was the result of my dissertation research at the University of Wisconsin–Madison, guided by educational historian Bill Reese and historian of science and medicine Ron Numbers. I couldn’t have asked for better mentors.